Say the word Spain, and chances are you don’t automatically think of skiing. 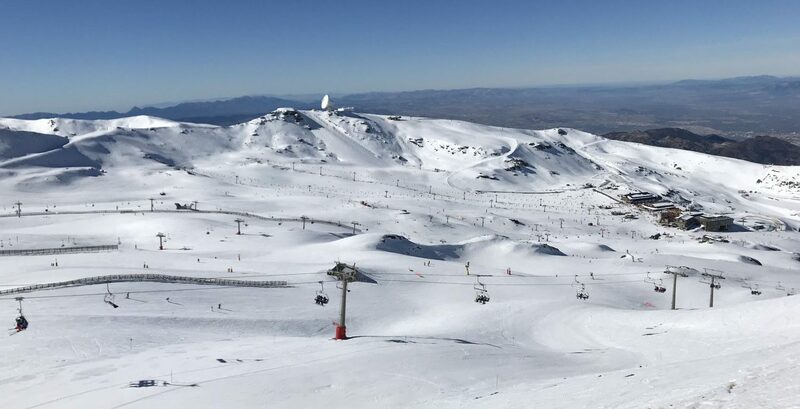 But the Sierra Nevada ski resort in Andalusia, just a short distance from the town of Granada, is a popular destination for beginners and experienced skiers, as well as snowboarders. And no wonder. It’s perfectly possible to ski in deep powder snow in the morning then head on down to the beach just over an hour away for an afternoon of sunbathing. Whether you’re flying into Malaga airport, or arriving from somewhere else, chances are you want to get to the snow as soon as possible. Our Sierra Nevada ski transfer will pick you up, along with your luggage, ski equipment and skis and take you straight to the resort. Get in touch to get a quote and to book your ski transfer with Simply Shuttles. Once you’ve booked your Sierra Nevada ski transfer, we’ll send you a detailed itinerary including pick-up and drop-of locations and times and dates. Motorway toll fees and taxes are included in our rates and there are no additional costs for skis and equipment.